Nottinghamshire v Derbyshire LV= County Championship Div 1 - Day 1. A fine 145-run partnership between Wayne Madsen and Shivnarine Chanderpaul has put Derbyshire into a strong position after a rain-effected opening day against Nottinghamshire. Madsen (pictured above) and Chanderpaul both completed half centuries in the afternoon session, ending the day unbeaten on 67 and 78 respectively, before rain at the start of the evening session forced an early closure to proceedings at Trent Bridge with the visitors on 245-2. After losing the toss, Derbyshire were asked to bat first under overcast conditions - but the opening pair of Billy Godleman and Chesney Hughes made an excellent start, putting on 89 runs for the opening wicket. Hughes played fluently throughout his 83-ball innings, hitting nine fours, to complete a brisk half century before falling shortly before the lunch interval for a well-made 59. The hard-hitting left-hander was ably assisted by Godleman, who added 28 from 88 balls until he was caught behind off Adams at the beginning of the afternoon session. The wicket of Godleman, however, would be the hosts' last breakthrough of the day as Madsen and Chanderpaul shared a 145-run partnership before rain washed out the final session of the day. The pair, who enjoyed a 256-run stand against Surrey in the county's last four-day fixture, played at ease throughout the afternoon session, hitting boundaries through both the on and off side as part of their unbeaten partnership. 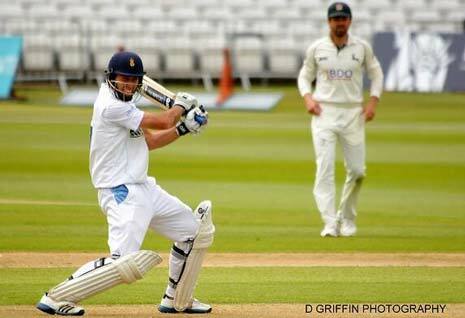 Madsen was first to his half century from 94 balls, as the Club Captain became the first Derbyshire batsman to reach 500 Championship runs this season - now currently the sixth highest run scorer in Division One. World number two Test batsman Chanderpaul completed the same feat three overs later from just 60 balls - including six fours - as the stand exceeded three figures pushing Derbyshire onto 240-2 at tea. Play did resumed briefly after the interval, but rain and bad light minutes later forced the players off the field for the remainder of the day with Derbyshire on 245-2 after 65 overs, ending a good opening day for the visitors.